The observable toll for ancient furniture arises in cases of non-observance of storage conditions and worthy operation. Restoration – difficult, expensive process, and all efforts become vain if the furniture after restoration has appeared in adverse conditions. 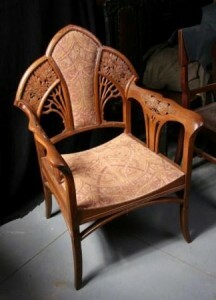 Owners of ancient furniture should provide indoors the necessary temperature and humidity of air. The optimum temperature of air – 18ºC, admissible – in limits from 15ºC to 20ºC, and humidity indoors should be within 50 %-60 %. Also it is necessary to consider that in badly aerated rooms during the autumn period humidity of air fluctuates within 85-90 %, and with the beginning of a cold season humidity of air falls to a level in 40 %. Such differences of humidity are unacceptable, especially if face-work was made by a method of veneer or the technics intersion, mosaics or a marquetry. At products where various breeds of wood were used or is present the old and new materials reacting to change of humidity, there are internal strains that causes cracks in wooden or damage of glued places various components. Negative influence of the raised level of humidity of air can be reduced, accordingly, having established indoors ventilation system. If humidity of air is low, it is necessary to use special humidifiers or to place near to furniture a vase with indoor plants with the water environment. The placing of furniture near the heating systems is inadmissible, the distance shouldn’t be less 0,5 meter. It is necessary to protect furniture from influence of sun rays, for these purposes change of a site of furniture indoors so that the sunlight sways on various surfaces of products positively affects. Often damages arise in the course of furniture transportation. In avoidance of breakages of wooden details from the furniture is necessary for transferring, instead of to move. For case furniture use special supports under legs that prevents a warp and free movement of shutters of doors. Timely and careful tendance is an essential condition for preservation of appearance of products. For wiping of the the dust from a furniture surface use a dry fabric. Polished and waxed surfaces are necessary for protecting from drops of a moisture and thermal influence. It is impossible to subject furniture to the big loading. Against occurrence of the moth in upholstered furniture it is necessary to use natural materials – an eucalyptus or a lavender.